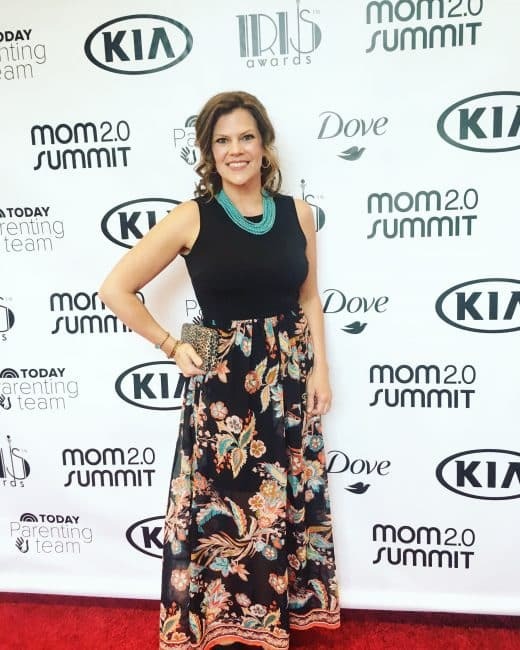 Last week I attended the Mom 2.0 Summit for the 4th year in a row. It’s one of my favorite industry conferences for a few reasons. Mostly because I really feel like I can be myself there. I also try to have fun with my Mom 2.0 conference style, because why not?! I’m sharing my looks today and if you were there, I’d love to see your recaps too. I always travel and room with my girls Fadra, Erin and Melissa and for that reason, Mom 2.0 has really turned into so much more than a learning experience. It’s a chance for us to catch up, swap ideas and enjoy being with friends. This year was no different and we even built in a few extra hours on the first and last days to make sure we got to hang by the pool and relax. 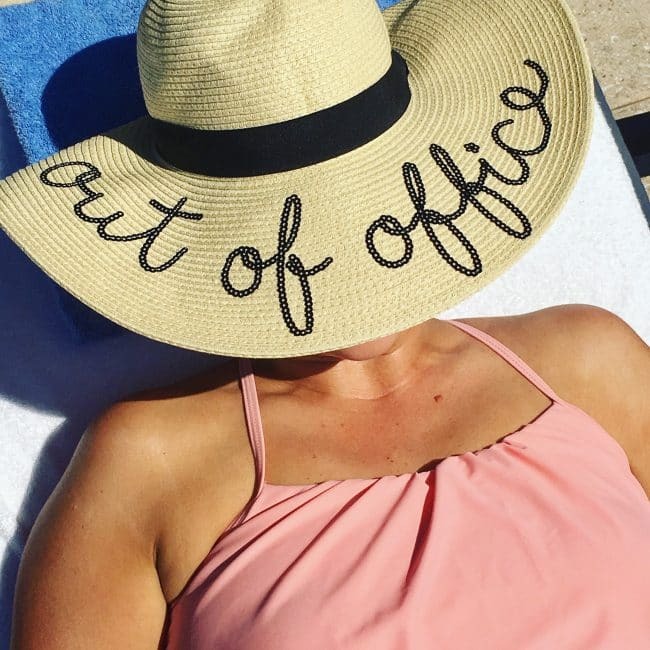 I found this hat at Ross and it was the hit of the pool! I thought I’d share my looks from the conference to kick off my recaps. It was a great year and I already have my early-bird ticket for next year’s conference in LA. If you missed the ticket sales this weekend, don’t worry. They will go on sale again in November. Maybe I’ll see you there! I was a speaker this year so I wanted to have a fun and professional look for my session on creating blog campaign reports. I went with this Target top and blazer with my favorite Lou & Grey jeans and these fun wedges from Ross. My turquoise necklace is Stella & Dot and the Mom one was a gift from my time on the Disney Parks Moms Panel. 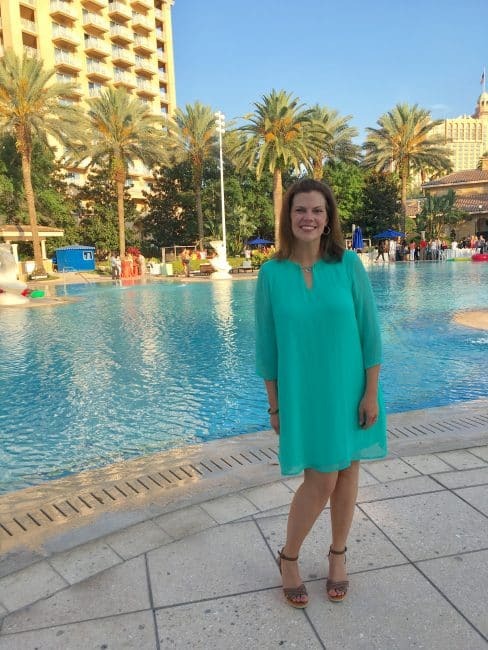 This dress was a steal of a find at Ross (you may notice a pattern here) and so perfect for the opening party by the pool. I wore colorful wedges I’ve had for years to complete this party look. I know I’ll be sporting this again and again this summer with sandals. Totally forgot to have someone take my photo on the first full day of conference sessions. That said, I managed to snap a bathroom selfie because I just love this look! It was probably my favorite outfit of the week. The dress and wrap are from TJ Maxx and I got the tassel necklace at a local shop (but I’ve seen similar at Target) and the shoes are Target. 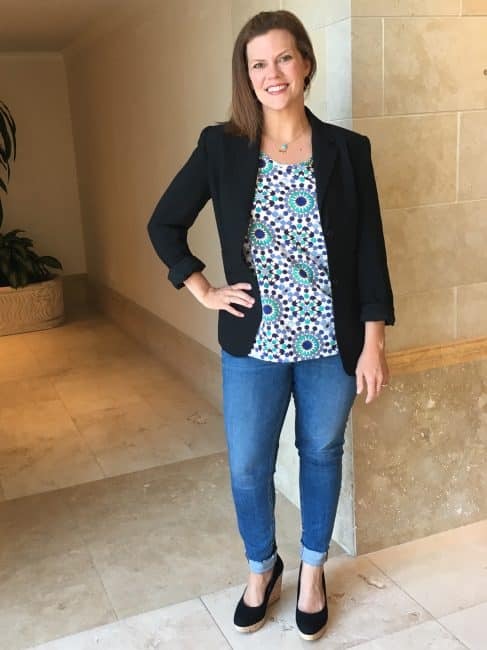 For the evening party and my dinner hosted by General Mills, I took off the wrap for a fun evening look! 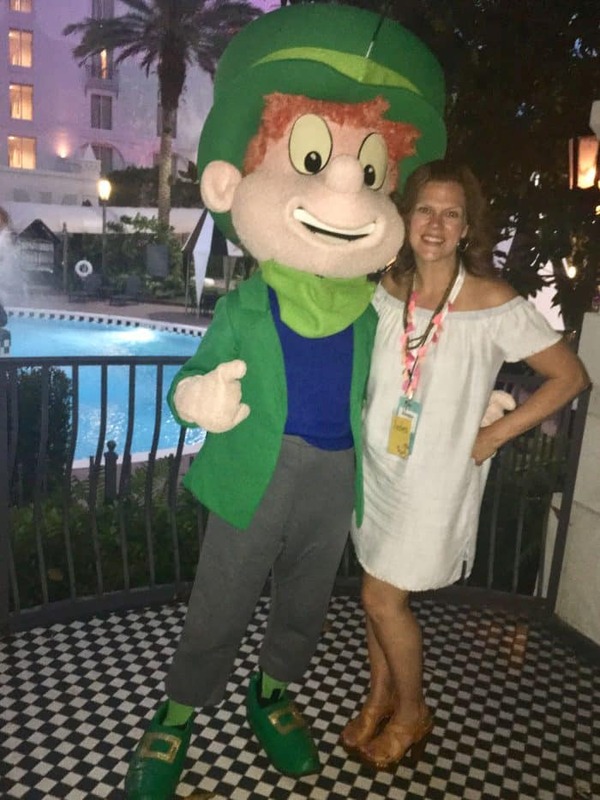 And I even met THE Lucky from Lucky Charms! The jumper I wore on Friday was another Ross find and I’m still on the fence with this one. It’s insanely comfortable and I really like the idea of this look. But by the end of the day I just wasn’t feeling it. Does that ever happen to you? Maybe it was the fact that I’d been on my feet for two days straight or maybe it was general fatigue. Either way, I’m not sure this outfit will appear too often. Finally, Friday night was the Iris Awards, an industry conference celebrating the parenting blog space. It’s a fantastic night of fun and everyone loves getting all dressed up. Knowing it was Florida and I wasn’t sure how much of the red carpet would be outside, I didn’t want anything too heavy. I scored this dress (again from Ross) and I love it. The necklace and bracelets from Target completed this fun look. I had a blast at the awards and cheered like crazy when some of my friends won. Of course Mom 2.0 is about way more than the clothes, but this is about all the energy I can expend for today. I hope to recap more soon but I’m going to need more coffee for that. 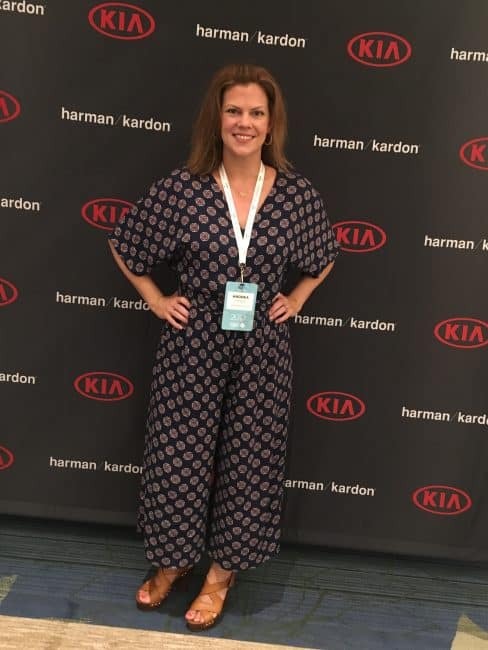 Were you at Mom 2.0 in Orlando? I know I didn’t have a chance to say hi to everyone. Please comment below and let’s connect so we can be old friends by next year! SO cute! 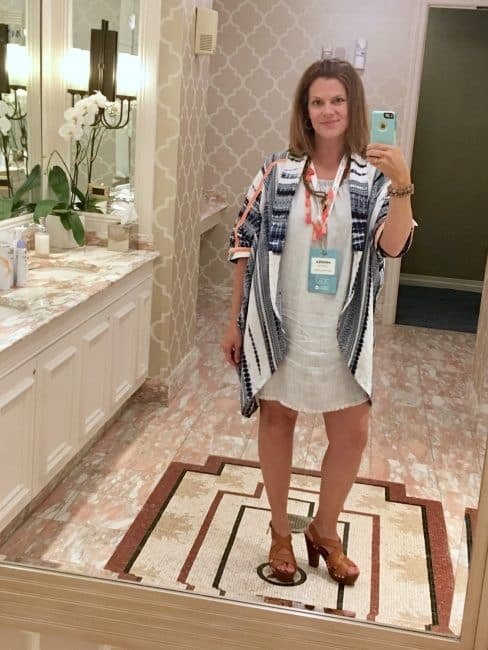 I love having definite “outfits” for conference events . . .it really helps! I agree! There is just so much to do. I can’t get bogged down with options! Love the award night dress and necklace! All your styles were flattering (even the jumpsuit!) Hope to see you next year- I already have my ticket! Thanks so much! I will see you there! You looked gorgeous the entire time! Thank you my friend! It was great to see you :). You keep it up now, unerdstand? Really good to know.